Earlier this month we wrote about how "SK Telecom & Samsung performs 5G EN-DC tests, achieve 2.65 Gbps". We also explained this is mainly because of the large bandwidths available to each of the South Korean operator. SK Telecom has completed the key test for mass production of "Galaxy S10 5G" on 25th, followed by 2.7Gbps class 5G + LTE combination technology and "quantum cryptography" network. 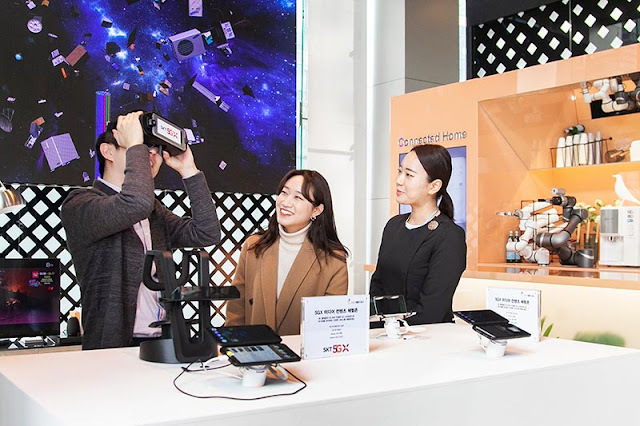 For the past two months, SK Telecom has tested thousands of items including '5G Device Test Lab' in Bundang's office building, and interoperability testing between 5G network and smartphone, interface verification, and frequency compatibility at commercial sites. We also made a scenario-specific test by creating more than 100 virtual environments using special equipment in the laboratory. '5G device test lab' and commercial network performance test is required to be able to launch the smartphone formal. This is why the process is called the final gateway to commercialization. With the completion of the core test, the launch of the world's No. 1 5G smartphone is expected to be smooth. In the next step, SK Telecom will conduct a delivery inspection this week for mass-produced products produced at factories. The company plans to make its first launch of the 5G smartphone without any problem. In addition, SK Telecom is preparing to hire a new 5G technology such as '5G Media Compression Technology' to reduce data consumption and 'Galaxy S10 5G'. "5G-LTE-WiFi 3-stage coupling technology" is followed by "5G-LTE combining technology"
SK Telecom succeeded in verifying '5G-LTE combining technology' that speeds up to 2.7Gbps on November 11, and it was installed first in 'Galaxy S10 5G'. Furthermore, SK Telecom implemented the "Triple Aggregation", which uses ▲ 5G ▲ LTE ▲ Wi-Fi for data transmission at the same time, in the Galaxy S10 5G, and completed the verification in the 5G commercial network. The 'three-tier technology' allows users to download content or applications up to 3.9 Gbps in areas where three networks are simultaneously deployed. In just 4 seconds you can get a movie (2GB) on the other hand. SK Telecom has upgraded Multi-Path TCP (MPTCP), a technology that connects LTE and Wi-Fi, and implemented the '3-step combining technology' preemptively to the Galaxy S10 5G. Some people are quick to point out the different strategies by different South Korean operators. Dual connectivity means higher speeds but higher latency too while standalone will means lower latency and maybe lower data rates initially. As we have pointed out, the South Korean operators have already got large amounts of 5G spectrum so speeds will be no issue in long run.